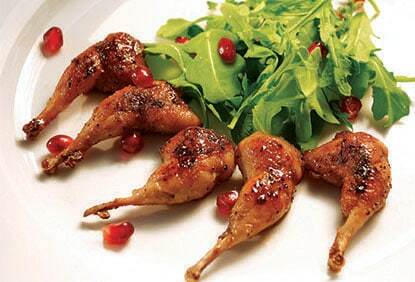 Texas Quail Legs with white wine pomegranate reduction. Big D’s Chef Gorji will again be in the thick of the action, when GO TEXAN’s Annual Restaurant Round-Up kicks off July 1st. At the month long celebration at Canary By Gorji, the back-to-back Texas State Cook-Off Champion will be serving up carefully sourced Texas dishes paired with international award-winning Brushy Creek Vineyard wines. Gorji’s use of local ingredients and unusual combinations such as pomegranates with steaks has led critics to call his cuisine “Mediterranean With Texas Twists”. This year’s Round Up menu is an all-star line-up featuring dishes that have garnered critical and media attention throughout the year. A longtime Texas shrimp proponent, he was recently featured on FOX4 cooking these savory crustaceans. The seared quail legs were highlighted in a Dallas Observer review saying “Carnivorous diners could easily have dreams about Canary’s offerings, haunted by memories of crisp-skinned quail legs seared to melt-in-mouth perfection,” as well as saying “his boar was cooked flawlessly.” Rounding out the menu is a surprising summertime treat using sweet tomatoes, Tito’s vodka and ice cream that was recently featured by Zagat Buzz. “As a former hunter/fisherman, I feel the Texas wild boar, quail, gulf shrimp and fish are rubbing shoulders with the rest of the world, and may I dare say, maybe even better. As equally impressive, Texas wines are making a very strong showing and winning international wine competitions,” says Gorji. Texas Wild Boar & Pork Tenderloin Duet with Gnocchi, Texas Bleu Cream Sauce and Grilled Vegetables. No Replies to "Chef Gorji Serves Up Lone Star Delicacies On GO TEXAN Menu"